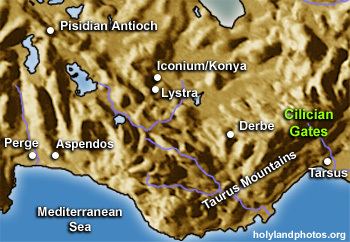 The Cilician Gates is really a pass in the Taurus mountains though which almost all traffic passing between the Cilician Plain (Tarsus) and the Anatolian highland (Iconium) passed. The idea of a "gate" seems to refer to that which one must pass through, and through which access can be controlled. In ancient times the Persians passed through this area on their march westward, but later the Greeks, led by Alexander Great, pursued them through these "gates" in the opposite direction as they retreated eastward. The apostle Paul must have passed through this area at the beginning of his second and third journeys. The Cilician Gates, lie 27.5 mi. [44 km.] to the north of Tarsus (via the ancient road system). This pass has always been of strategic importance.